When it starts to get chilly outside, my mind starts thinking about my crockpot and crocheting. I love to sit down and the end of a long day and have a yummy pot roast from my crockpot to eat for dinner. Crockpots are a great resource for busy families. Not only do they require little to no maintenance, but you can throw a cheap piece of meat in there and make it fall apart. Cheap and easy! I love it. So in preparation of all that awesome fall weather right around the corner, here is a fun round up of crockpot recipes! Sunday- laundry- hopefully, fingers crossed! If you follow me on twitter you might have seen I made my very first turkey. I've never had the need to make one, but my grandma gave me a turkey so what do you do when you get given a turkey? You cook it! I asked for some advice via social network and did an abundance of research (yes, I usually over kill research…) so I would ruin this massive bird. I used this recipe, along with some advice from just about everyone I knew. I decided not to use a turkey bag, against everyone's judgement. I borrowed a GE 18 quart roaster from my Momma. For some reason it was a lot less scary to cook the turkey in this rather than in the oven, ya I don't know why either. But with a lot of prayer and peeking at the turkey every 10 minutes, lol. I made a turkey. I successfully did not ruin a 15 lb turkey. It is a miracle! Give it a Whirl Thursday will be a weekly column documenting triumphs and failures of frugal projects. I am always trying to find ways to trick myself into drinking more water. I am more of a pop girl, which is not at all healthy. One of the tricks I use is a big mug. My favorite mug is from a local hospital, the only issue is to fill it up with ice take half an ice cube tray. It is frustrating to have to be constantly making ice. There is something special about finding a little treat in your ice cube. You expect just a regular little ‘ole ice cube floating in your cup and you look down and low and behold you have a treasure! I thought it would be fitting to start this collection off with something you would normally find in water. Lemons. Lemons are cheap and have great health benefits. 5- very old eggs that I won't share their expiration..
6- 1/2 inch of milk.. I can’t seem to get journaling off my brain. I love being able to look back and see what I was doing 1 year ago or 5 years ago. However, how many people actually journal every day? I know I don’t, and I probably never will. While browsing pinterest, I found a ton of fun ways to journal. I love the idea of doing “event” journals. Such as your summer vacation or gratitude journal or even turning a vintage book into a fun scrapbook journal. I am in love! I did not participate in planning a menu last week and boy we suffered. There are a few new choices and recipes on this weeks menu. I'm looking forward to trying them out. I also successfully made my first turkey yesterday.. Yes, I am 25 and have never made a turkey.. but now I have and all though I don't want to do it all the time, I'm not terrified of the bird, more to come on that later this week. Today’s post is a part of the 20 something blogger blog swap. This post is written by Kelly over at Insert Clever Title here. Which by the way, why didn’t I think of that title?! It’s awesome, Kelly! She has a great blog and I am totally hooked. I have been reading it all day. She has a great writing style and outlook on life. I’m very excited to have her as my swap partner. 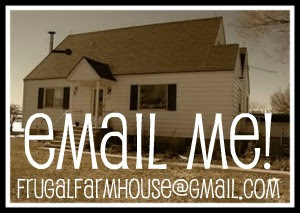 This is the first every guest post here at Frugal Farmhouse, so I’m a little, ok a lot excited! Also when you check out her blog, you get to check out my post on saving money in the summer. I have got Christmas on the brain. I think it is in the air. It is starting to get colder at night, a definite sign fall is on its way. There is something about the anticipation of getting through December and enjoying Christmas day. I enjoy the feeling, smells, and overall experience. I always put too much pressure on myself. Did I buy enough? Did I buy too much? Why didn't I make that new cookie recipe? Did I spend enough time doing this, doing that... Oh the stress! However, I love it. What holiday are you in love with? I have a photo a day blog. I use it as a sort of gratitude journal. I learn from my sweet dog each day. I explain it here. Each week I will post my week in pictures. Also it is a great way to reflect on Sunday. I hope you enjoy.